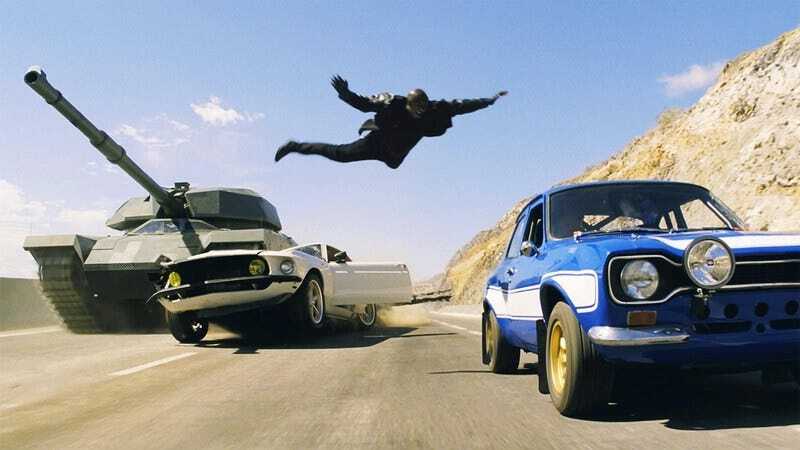 From its humble beginnings as a Point Break ripoff set on the streets of sweaty, sepia-toned Los Angeles, the Fast And Furious franchise has grown, matured, and upped the stakes so many times it doesn’t even register on the same scale as other movies. In the series’ latest installments, the ever-growing cast of characters are less likely to take part in a simple street race and are more often tasked with thwarting some global terrorist threat, which they ultimately resolve using a combination of street smarts and a massive stunt and CGI budget. Truly, it’s been a long road. Around the halfway point of this adrenaline-pumping compilation—assembled by supercut aficionado Burger Fiction—there’s a palpable shift in the tone of the franchise. The first three films were flashy, street-race-focused affairs about outlaw speed junkies with hearts of gold. But with 2009’s Fast & Furious, the franchise dropped its definite article and gained a very serious attitude towards driving fast. This was around the same time “family” stopped being a shorthand for “the main characters in these films” and started becoming the mantra of the franchise, a justification for any truly insane thing the writers needed to happen. The latter half of the soon-to-be-eight film series is where things really get interesting, which, if you’re not on board at this point, is not exactly a great selling point. Luckily, as a new viewer you can jump in wherever you want, since the over-arching plot of these films boils down to: Explosions are cool; women are attractive. Fast Five includes numerous moments which could be accused of “jumping the shark” but instead, the seemingly invincible protagonists strap rockets to the shark and ride it into a flaming tank the on edge of a mountain in Siberia. From this point forward, Vin Diesel and the gang—who as a reminder, were just working-class crooks a few movies ago—seem to have endless wealth and resources, super powers that prevent them from ever being too badly hurt, and a complete disregard for the lives of anyone outside their “family.” It is, as the F&F-lovers on How Did This Get Made? would say, next-level bonkers. With The Fate of the Furious right around the corner, the bar is undoubtedly going to be raised again, continuing the 16-year tradition of this series outdoing itself with the amount of explosions, girls in bikinis, and blatant product placement they can fit into one film. With luck, in a couple years, they’ll do it all again.